It has been a long time coming, but finally we have had time to revamp the forums for a fresh start to a new era in Simatography. Behind the scenes the staff has been debating and rewriting, discussing and revamping the layout for the forums with the goal of making them easier to navigate and to find the things that you really want to find. Read below for a bit of a guided tour. 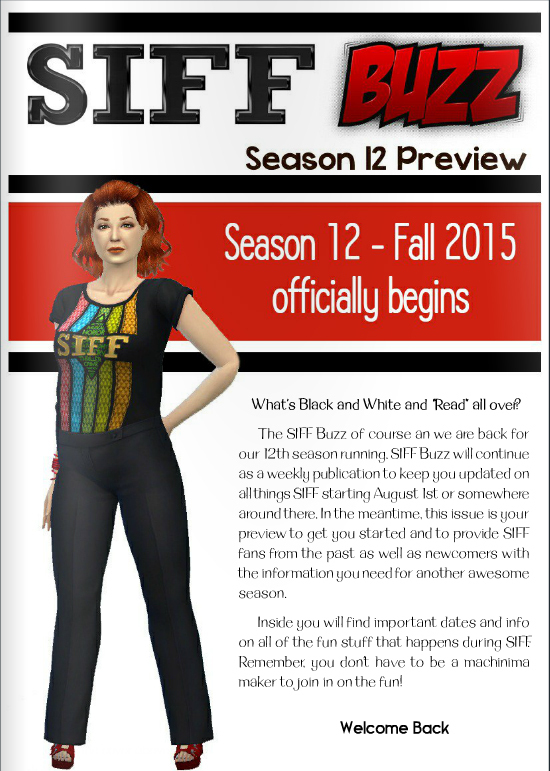 The biggest change to make note of is that we have opened up some sections for Sims 2 players and in preparation we have opened threads for the soon to come Sims 4 players too. The green room is a term used in show business as the place where performers hang around before they are needed on stage. Our Green Room is a place for our members to start out before diving out into the forums. We recommend that everyone reads the MEMBER GUIDELINES HERE first, just to be familiar with how we roll. You can also drop in and introduce yourself HERE. The rest of what you find in the Green Room are threads for general discussions about gameplay and real life stuff. Well, this section is self-explanatory really and there are no major changes. Within the next month, as we roll out promotions for our upcoming 10th anniversary, we wil clean up this section a bit more. We will also be reorganizing the downloads section to make it easier to find SIFF specific downloadable objects for your SIFF projects. We have rearranged things a little bit so that you can find the challenges that you are looking for - now separated into Photography, Machinima and Mixed Challenges for Everyone. What is new and coming? Shutterbugs Photography Club will start up again soon with a new concept much like that of a real-life photography club. Watch for details soon. 100 Themes challenge is ongoing and going strong. HAPPY - a machinima challenge has just been launched and there will be another new machinima challenge lauching within the next week or so. Rockabilly Party is our current all talents challenge for everyone to enjoy. We made a few minor changes here to allow members to share their projects in a more organized setup. It should be clear now where to post your project announcements. Don't be shy! We want to know what you are up to. Once again a more organized approach to share and request custom content starting with a sectioin for our members to share their own handmade content. Well this is pretty obvious too. We all can use a little help at sometime or another. To be sure to avoid confusion we now have separate sections for Sims 2, 3 and 4 specific topics as more Sims 2 and future Sims 4 players join us. Customer Service is where you can get help with anything relating to our website, and Classified Ads is a section for you to post your ads when you need help on a project, are looking for people to join you on an MEP, or if you are looking for voice actors for example. 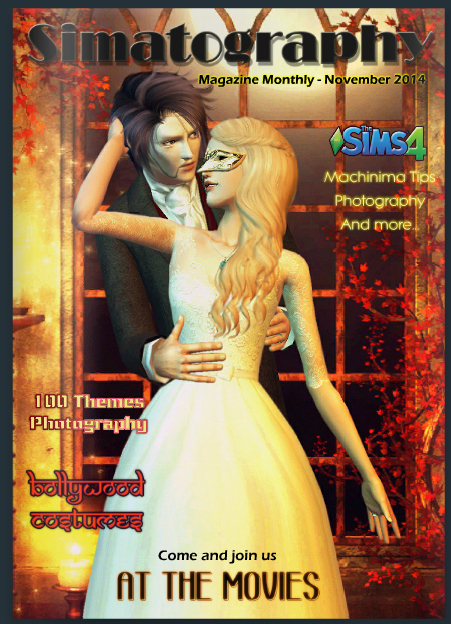 We have a wealth of information and tutorials for everything from Machinima School, Photography Tips and tutorials on a number of creative and technical topics that will surely help you improve your art. Have a peek at what is there, you might be surprised. So we do hope that you will find your way around before too long as we get a fresh start to a new era at Simatography together! The curtains close on another exciting season of the Sims International Film Festival as we announce the winners in The SIFF Buzz. 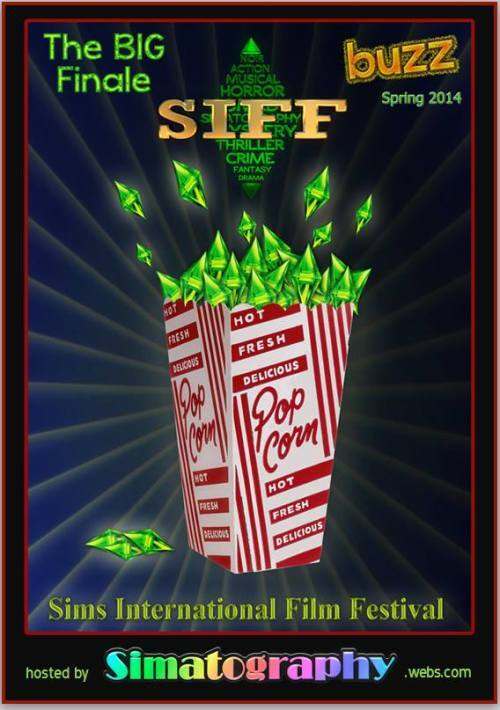 As always, SIFF was an outstanding showcase of talent and creativity featuring both Sims 2 and Sims 3. There were so many wonderful flims to watch, and if you haven't seen them you can still check them out on our YouTube page in the Spring 2014 SIFF Playlist. It couldn't have been easy for all of you that voted, and we would like to thank every one of you for voting and helping us picking the winners. It wasn't easy for us behind the scenes as we debated for hours to pick those that recieved honorable mentions for their outstanding work. The Battle of the Bands was also a tough competition this time around with a record 14 bands. Going into the fall we are planning many big things for our 10th anniversary and we want everyone to be a part of it. Keep watching the site for all the exciting things to come, including a new site design that we hope will make everything easier to navigate, machinima challenges, the on going 100 Themes Photography Challenge and so much more. We can't wait to share everything that we havce planned for the 10th anniversary and we hope to see you there. Again, a huge thank you to our participants and our fans for making the Sims International Film Festival what it is, and for making it bigger and better each season. You are not going crazy. Yes that think you saw a moment ago has moved. Oops. We are currently in the process of a complete site overhaul. Accidentally we moved and published a few changes that were meant for after SIFF so please forgive us for any confusion. We have big plans. With SIFF's big 10th anniversary coming up, we really have been considering how to make this site as best as it can be. I have never been able to keep up with the changes alone, but now with the team of staffers Gus Rockman, Jorgha Haq and Peacemaker working hard behind the scenes we have decided to rip the site down to its foundations and rebuild it again. Keep your eye here on the news and we will try to inform you on the steps along the way. We want a bit of a new look, we want things to be easier to find, and we want important things to be accessible without having to dig through the forums for them. We want the site to be more user friendly and easier to navigate for newcomers. So bear with us. We know that change is sometimes difficult, but necessary too. We are excited and we think you will like the new look once it is all done. The new issue of Rising Stars Magazine is out with Band Search hopefuls, Neon Tarantula. You can read it HERE. If you missed any issues you can find them all in the forum HERE.